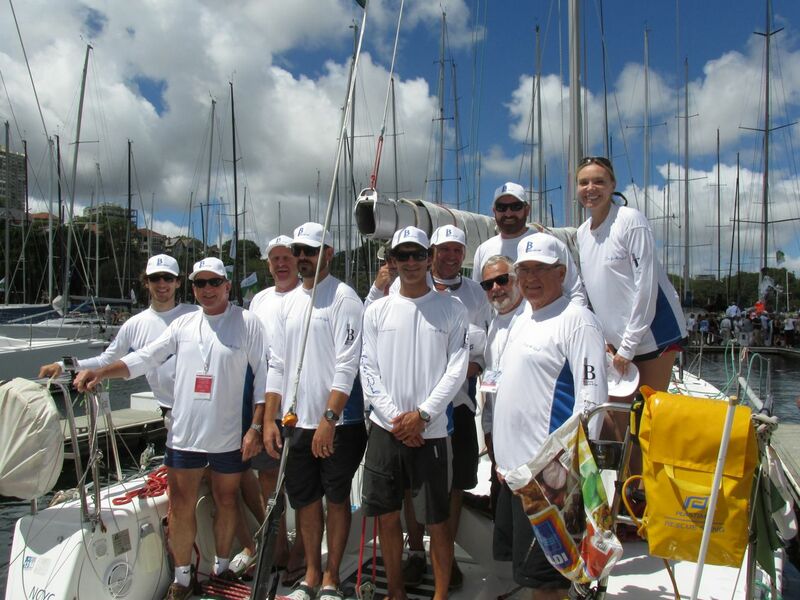 Ronnie Simpson checks back in with Part 2 of his Sydney-Hobart adventure. You can read Part One here, and check back on this page for a final and probably debaucherous Hobart wrap-up later this week from the inimitable Mr. Clean. Back to a non-poled out jib top in 40 knots, I remained on the helm and we managed more 16-18 knot surfs, but at horrible angles with the poor reaching jib flogging itself to death in the lee of the main. As the breeze dropped slightly, we hoisted the A3 and eventually chose to go back to the A2 around dinner time. I was off watch and down below when I heard the crew preparing for the peel. With just one tack line on the bow-sprit, we can not do proper kite peels and must douse and then re-hoist the new kite. Hoisting bareheaded the A2 wrapped itself around the headstay in what became the worst kite wrap i’ve ever personally seen. In one of those moments when a racing sailor sheds a tear of compassion for both the boat and the owner, we sent Ben up the rig to cut away the kite while myself and Rod “Fergo” Ferguson cut away the kite at the bottom. Eventually, we got the remains of the kite down into the forward hatch. More time lost. Things were going from bad to worse and the wheels were falling off for One for the Road and her crew. Back into the A3, we were under-wicked and slow, gybing dead downwind to remain where we thought we wanted to be. Watching the barometer continue its rapid decline, we were expecting the breeze to go light and then instantly shift to the W-SW and quickly build with a forecast 50-60 knots on the leading edge of the front. Ben spotted the quickly approaching cloud line around sunset. Light refracted by the approaching moisture lit up the sky into a million fiery shades of pink and orange shrouded in an ominous grey cloud cover. It looked nothing like the lead-colored, cigar-shaped cloud line that I had read would indicate a southerly buster. Watch leader Jeff Shute made the call “kite down now! #4 jib on deck, deep reef the main!”. In a scene straight out of Rob Mundle’s book “Fatal Storm” (about the ’98 Hobart race), we were all on deck for our chinese fire drill, which we pulled off in just 3 minutes. The main was double, then triple-reefed as we expected the blow. The shift was immediate and with 20 knots we sailed slowly for half an hour before it built to 30. Then 35. Then 40. Less than two hours after dropping the kite, we were in the full force of the front with breeze in the mid-40’s puffing into the 50’s. Adrian was driving as I began thinking to myself that it must be hard to drive as his normally spot-on helming was up and down of course. Handing me the wheel, I was confronted with the reality of how challenging the driving was. Driving half my shift 4-hour shift with 3 reefs in the main and #4 jib up, it was some of the most full-on, gnarly sailing i’ve ever experienced. Waves slammed into and broke over the boat with a spray that made it nearly impossible to keep my eyes open. Driving almost entirely by feel, I merely tried to keep the boat on course and avoid upwind wipeouts. With the new sail configuration, the boat drove like a Cadillac while she tore through the building seas like a race horse on crack, leaping up and over each wave. With no light pollution and the strong clearing breeze, the stars were amongst the most brilliant i’ve ever seen while every wave that broke over the boat brought a million bright green specks of bio-illuminescence. It was beautiful heavy-weather sailing and while the breeze remained in the 40’s, the seas stopped building as we sailed into the lee of Flinders Island, just north of Tasmania. I went off watch and when I came back up, the sun was up and the breeze had moderated significantly, now down into the high 20’s and low 30’s. Back to the #4 and we started shaking reefs. Within another hour, we were reaching along in champagne conditions about 13 miles east of land. By 9 am, we hit a transition in the breeze and became almost becalmed in a lumpy, confused sea state with residual slop that had rounded the corner from the west only to meet several variations of southerly swell coming up from the Southern Ocean. We chased the breeze, attempting to sail from wind line to wind line; not an easy task when nearly becalmed in lumpy seas. Big John Searle the rugby player and dinghy sailor shined in the tricky tactical conditions and kept the bus rolling. With our bottled drinking water nearly gone, we prepared to make the switch to the water tank. In a race where even the easiest of tasks turned into monumental struggles, even this normally mundane chore became an arduous ordeal. With no manual water pump, pumping water would require electricity. Electricity that we barely had. After a brief debate, we flipped the water pump switch and began filling water bottles. The water came out brown. Our lone water bladder that we left full before leaving Sydney had ruptured during the rough night and become contaminated by the endless procession of water that ran through the boat in the hectic crossing of Bass Strait. We were now faced with a grim reality: 6 liters of bottled water now had to last 10 people more than 24 hours. In what was one of the most challenging days of sailing in my recent memory, we had to fight highly variable, shifty conditions all the way down the coast of Tasmania. Were we too far inshore? I don’t know. None of us knew as we were on very limited weather data, with only the electrical capacity to receive verbal forecasts via the SSB radio sched’s. With 4 knots of breeze gusting to 25 out of every possible variation of south, we soldiered on in a tack – tack – sail change – tack – sail change fashion with up to half a dozen other boats in sight at times. Boats inshore would catch a puff lift and put a mile or two on us, while the boats outside would die off. The scenario would then exactly reverse itself in this navigator’s nightmare. The breeze began to fill and solidify from the west during the very early morning and by day break, we were reaching along with a full main and #3. The jib top would have been the right call, but it was still on strike after it’s massive flogging in the strait. Things felt a bit cruisy, so we put up the #2. Things still felt a bit cruisy so we put up the A1, which we knew would be a bit dicey as the angle and pressure would put us on the edge. Kym drove us on the ragged edge of control. I was off watch, so after the kite was up and the jib was back down, I went down below. A few minutes later, I heard a sail flogging and a lot of yelling, so I jumped on deck to see the A1 coming down behind the boat. The tack line’s block on the end of the retractable bow-sprit had broken off the sprit. The design is that of a threaded pad eye attached into the end of the sprit and the pad eye broke flush with the sprit. The kite partially went into the water, but we managed to get everything back on board while the #2 was re-hoisted. With a freshening breeze, we were back in the #3 within a few minutes. So much for my final off watch, which I was desperately hoping for so that I could be rested for the final approach to the finish. We rounded Tasman Island at about 10:30 in the morning, hardened up on the breeze and began beating into Storm Bay. We each took a sip of Drambuie and toasted to the Newcastle-based 40-footer Aurora, who donated the bottle to us after missing their first Hobart in 15 years. Throwing in a couple of tacks, we were again disheartened to find another problem. A mainsail batten was working it’s way out of it’s pocket and moving forward with half the batten in the pocket and the other half working forward towards the mast. We contemplated sending Ben up the rig but it would be doubtful that one man aloft could fix the problem. We dropped the main, shoved the batten back in it’s pocket and re-hoisted, which is always a difficult chore on a bolt-rope main. More boats slipped by and more time was lost. Sailing upwind on starboard tack, famed Tassie photographer Richard Bennett flew by in his airplane less than a hundred meters over the water to capture an image of One for the Road. We tucked in and shook a reef twice before the breeze shut off again. Becalmed in the middle of Storm Bay, we scanned the clouds over head and watched other boats sail in different breeze as we created a strategy. Big John again shined as inshore tactician. We worked to a wind line and saw another boat sailing 90 degrees higher than us on port tack, about a mile away. Our angle was atrocious and we all wanted to tack to starboard and try to get into the same breeze. Kym urged us to wait a moment longer before tacking and as we stuck our nose further into the pressure we were initially knocked and then the lift came. Pressure again increased, and we had a beautiful port tack beat straight towards the River Derwent. We threw in a couple quick tacks to clear the Iron Pot and then passed a bottle of Pusser’s Rum down the rail. Our third sip of the liquor in 4 days. One for the Road was almost home. We cracked sheets as the river turned right, as I again longed for the jib top. 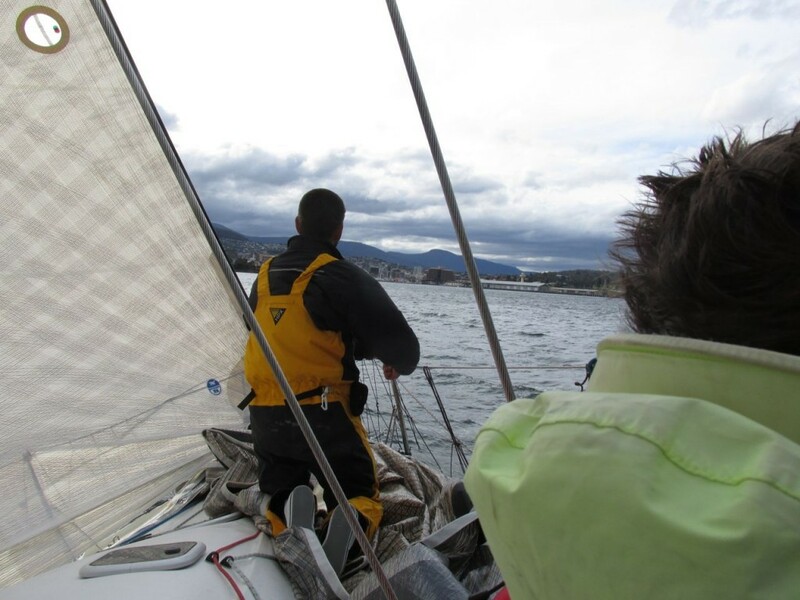 Approaching Hobart, I got a proper introduction to the River Derwent. There were holes everywhere, powerful gusts coming down and contradictory current that built as we made our way deeper into the river. We chased a Beneteau the entire time until they picked up a lift and sailed across the finish line. Minutes later, our private puff came down, we took a major lift on port and hardened back up towards the line. The puff tapered off, but before it died completely, we crossed the finish line just before 7 pm. It was over. I mentally broke out a black marker and added a large check to my bucket list, just as I added “do ten more Hobarts” and “win division in Hobart” to the ever-growing list. (Sail in the Vendée Globe is still written in 100-font bold print at the top…) Life is like working on a race boat, I suppose. Every time that I cross something off the list, I have to add two more and the process repeats itself as the work is never actually done. We achieved another goal of ours after the finish as we had enough electricity to use the engine to motor into the harbor and not require outside assistance. We dropped the main and lashed down the two headsails that were on deck. Motoring into the harbor, we cruised past the wharf which was filled to capacity with the annual “Taste of Tassie” festival. The lead singer of the band that was performing stopped his song early and recognized One for the Road for completing the journey from Sydney. The massive crowd on the wharf stopped what they were doing, put down their food and drink and stood to clap and cheer for us. A lone voice yelled “hip hip” and the crowd would respond “hooray!”. It was the most beautiful and heartwarming reception i’ve ever received at the end of a yacht race. We placed 17th out of 21 boats in our division, and about two thirds of the way down in the overall standings. It’s one of the worst results i’ve ever achieved in an ocean race and while the competitor in me is upset with our result, the sailor in me deeply proud and grateful to have sailed, and finished, this great race. Things don’t always go your way when you set to sea, but by working together, we all achieved something that is much more important than any poor result on paper. No two people on the boat ever argued with one another and all ten of us got off the boat much better friends than when we started. In my mind, we are all champions. As an American who has done quite a bit of sailing on the west coast, traveling to Australia to sail in the Sydney- Hobart has been one of the best experiences of my life and only increases my love for the sport and my resolve to constantly learn more and improve as a sailor. There were a million lessons learned and lessons reinforced during this race, but that constant learning curve is what keeps sailing fresh and exciting. This race was not just a race, it was a beautiful adventure that released the emotions that only true adventure can. That feeling that compels us to undertake challenging races; when you’re profoundly grateful for simple things like seeing the sun rise after a rough night at sea, when a sip of water tastes like fine wine, when a $6 meat pie on the street tastes like a gourmet 5-star meal. If I still have your attention after this marathon recap, I want to thank Kym Butler for this incredible experience and all of the crew on One for the Road. Rockstar sailors we were not, as we found ourselves thoroughly tested, but even if I were to hand-pick a crew I could not pick a more enjoyable bunch to spend four days with than the nine strangers that i’m now honored to call friends. It’s the Sydney-Hobart, and whether you are a boat owner, crew, or just a random guy or gal looking for a great adventure; put it on your bucket list and make it happen. You will never regret it.